From 23rd-29th November 2015, Brake will be hosting their annual Road Safety Week. 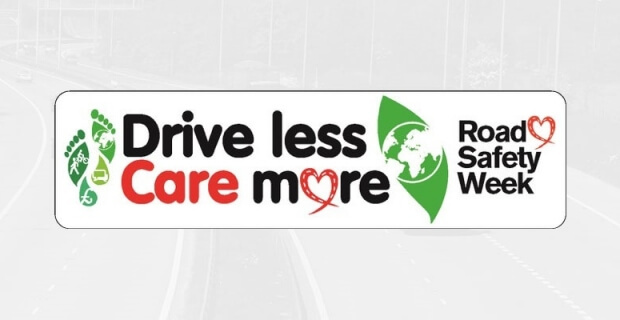 The theme this year is ‘Drive less, live more’ which aims to inspire people above and beyond the realm of road safety. The theme highlights the need to make our streets safe and pleasant to use in order to protect ourselves, the people around us and the planet. 22% of UK greenhouse gas emissions come from road transport. Air pollution is estimated to cause 24,000 deaths a year in the UK, half attributable to road transport. The number of cars is set to increase by 43% by 2035 and traffic delays by 50%. Brake want to encourage people to think about how they use the roads, and the method of transport they use for each journey. By walking, cycling or using public transport you can burn calories, save money and avoid creating extra pollution. If you’re driving, driving smoothly and at a safe speed will lower fuel consumption and reduce your risk of an accident. Register for a free action pack to help promote Road Safety Week at your school, workplace or local community. Connect with Brake on Facebook and Twitter and use the hashtag #RoadSafetyWeek to spread awareness. Support GO20 in your local community; a campaign which promotes the implementation of 20mph speed limits in communities. Check out Brake’s ideas for a fundraising event and get planning! Visit http://www.roadsafetyweek.org.uk/ for more information.